Binder Jetting is one of the most commonly used 3D printing technologies. However, producing successful prints using Binder Jetting technology is hugely reliant on implementing the right design approach. As with other 3D printing technologies, design for Binder Jetting differs significantly from traditional manufacturing techniques, requiring a completely different approach. That’s why we’ve put together an introductory guide to the key design considerations to keep in mind when using Binder Jetting technology – so you can achieve the best results for your parts. Binder Jetting is a powder-bed process, and uses a print head to apply a liquid binding agent onto layers of powder. Like SLS, Binder Jetting doesn’t require supports, since the part is surrounded by the unbound powder which in itself works as a support structure. Furthermore, since the part isn’t exposed to high temperatures during the printing process, common printing issues such as warping and cracking can be avoided. 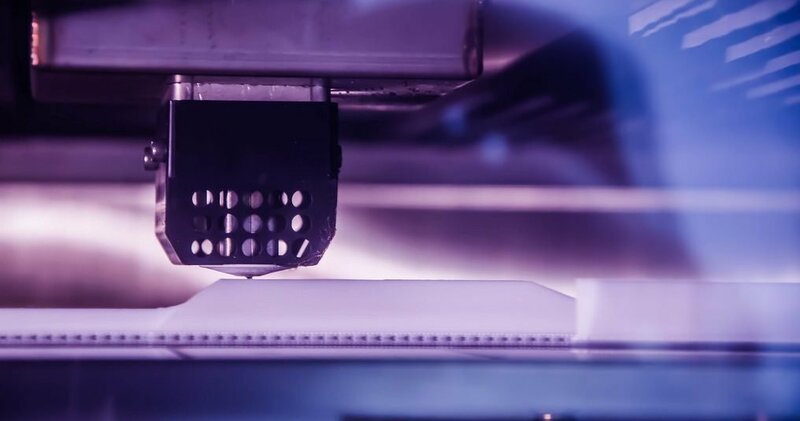 Compared to other 3D printing technologies, Binder Jetting machines typically have a larger build volume, making it ideal for printing large objects or nesting several parts on the same powder bed at once. Choosing the right wall thickness for your part can often make the difference between a successful or failed print. Inaccurate wall thickness settings can lead to undesired results such as deformation during the printing process or damage after removal from the build plate. So when using Binder Jetting to produce your part, make sure to stick to a minimum wall thickness of 2mm. As Binder Jetting uses powder material, escape holes need to be factored into the design, with hollow spaces. This will ensure the removal of any powder that could be stuck inside. While neglecting escape holes won’t necessarily result in a failed build, any trapped powder will add to the part’s weight — the properties of your part may turn out not as expected. It’s therefore advisable to design at least 2 escape holes with a minimum diameter of 0.5 mm. Binder Jetting produces parts in a green state, meaning that they are fragile and will most likely need some form of post-processing to strengthen them. Unsupported walls and edges must therefore be as strong as possible to prevent any damage. One way to ensure this is to design unsupported walls with at least 3mm thickness and unsupported edges with a maximum length of 20mm. Part orientation is one of the key elements to ensuring a perfect surface finish for your part. If you require a smooth surface finish for your part, make sure that detailed features are oriented on the upward facing surface of the part (X/Y direction) to avoid a stair-stepping effect in these areas. You may also want to explore the option of part consolidation — that is, designing several parts into one to save material and optimise build space. With the ability to create complex geometries and structures, Binder Jetting lends itself well to topology optimisation. Using computer algorithms, topology optimisation helps to optimise the shape of a part and remove excess material wherever possible, saving weight and material. Designers can therefore benefit from topology optimisation to create parts with complex, intricate designs. As with any additive manufacturing process, Binder Jetting has its own set of considerations that must be taken into account when designing for this technology. We hope that this list of design tips will give you an overview of the design possibilities of Binder Jetting and help improve the efficiency of your design process.